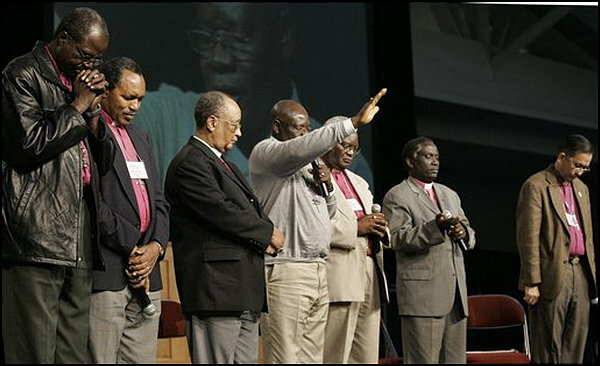 An international panel of Anglican bishops, from left to right, Luke Henry Okombi of Uganda, Emmanuel Kolini of Rwanda, Drexel Washington Gomez of the West Indies, Peter Jasper Akimba of Nigeria, Bernard Malango of Central America, Benjamin Nzimbi of Kenya, and Datuk Yong Ping Chung of Southeast Asia pray after a panel discussion at the Hope & Future Conference organized by the Anglican Communion Network headed by Pittsburgh's Episcopal Bishop Robert W. Duncan in Pittsburgh on Friday, Nov. 11, 2005. PITTSBURGH: "Take Courage. It is I. Don't Be Afraid..."
ANGLICAN HOPE: Bishop Duncan Says Archbishop Williams "Recognizes Network"